Do you like short "shortnames" or long shortnames? I dont really care as i own both MrKriz, Kriz and Agreements. 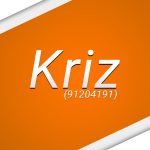 Kriz (91204191) Goodluck everyone ! No i dont. Have u ever been torched ? ROFL Life we all are humans we all done mistakes in past i think you are here just to cause drama and u should drop it right there .